Scroll down to review the graphics and comments related to the current inquiries and markings for which information is being sought. Any validation related to submitted information in the form of catalog references, advertisements, photographs or other documented sources will be appreciated. Where was each company actually located? When was each company operational? This is not a misprint. It represents multiple strikes. Any information related to any of these companies or the markings? Labels and markings are an integral aspect of tool identification and study. 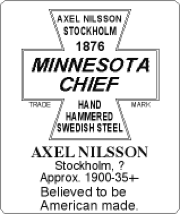 Axe labels are considered to be the most graphic and diversified of tool labels generally speaking. The examples above are but a few of over 2,000 that have already been redrawn based on originals and advertisements. Most have been connected with specific companies. Some are still questionable. The label facsimiles at the right have been carried over from the May 2007 posting. They originated from a source located in Maine but as yet no additional information has been forthcoming that deals with any aspects related to the labels. 1. What company used the labels? 2. What time frame were they from? The EGYPTIAN SPECIAL was a brand used by the Woodward Hdw. Co. of Cairo, Illinois. What did the label or marking look like? We will attempt to answer any reasonable questions concerning the identification of axes and the markings used to identify them. PICTURES are quite important and reinforce the old adage that ... “A picture is worth a thousand words.” Knowing who you are and where you are located is appreciated. Commercial use and/or reproduction is prohibited. 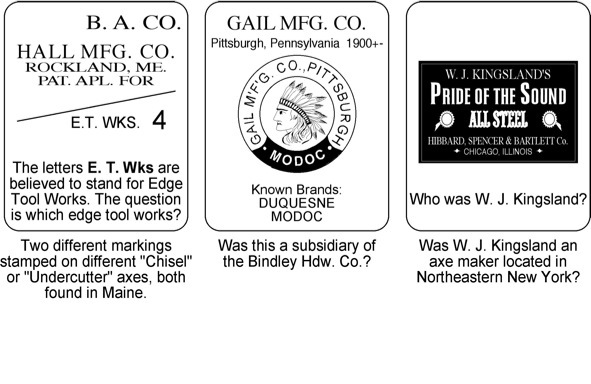 A curious axe marking involves an over-stamp or secondary stamp where the name CHAMPION AXE CO. was applied above the name G. WHITE AXE CO. The brand OLD RELIABLE was stamped multiple times directly on top of the G. WHITE AXE CO. marking. The HONESDALE, PA. mark remained intact. This suggests that an attempt was made to hide only the G. WHITE AXE CO. mark. Perhaps that was done to satisfy an order for axes with a specific marking and resulted in a hurry-up but poor attempt to remark the axe. 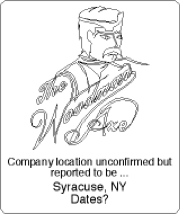 UPDATE: The CHAMPION AXE CO. was an alias name used by the Mann Edge Tool Co. of Lewistown, Pennsylvania. The M. E. T. Co. may have purchased the remains of the G. WHITE AXE CO. when they ceased doing business and subsequently the M. E. T. Co. may have remarked the axes involved . Little is currently known about the G. WHITE AXE CO. or SAGER & WHITE, the company that is believed to have preceded the G. White Axe Co. Sager & White is believed to have been replaced by White in 1842. It is also unclear if there was a connection between the G. White Axe Co. and Jerison White & Son of Providence (Scranton) PA.
Any information related to the G. White Axe Co. or Sager & White will be appreciated. UPDATE: References have been observed related to Sager & White, a company that is believed to have preceded the G. White Axe Co. Quite possibly the Sager that was involved was William J. Sager’s father or some other relative but it wasn’t the William J. Sager that invented the Sager Chemical Process. The time frame for Sager & White precedes William J. Sager. SAGER & WHITE Scythe & Axe Co. Your name and location are appreciated with any input or inquiries. 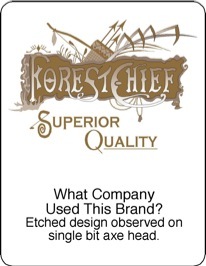 The graphics depicted immediately below represent some of the many etchings and/or stamped marking that have been observed on axes and/or hatchets that have raised questions about their use. As yet the questions related to them have not been resolved. Any assistance or specific leads that may help to provide more information about the brands and/or the companies that used them will be appreciated. The brownish tinting represents the coloring of the axe head including the etching as observed. It does not indicate the color of the base metal itself. It is believed that the axe head was treated with some chemical for protection from rust, possibly like gun browning, which imparted the transparent brownish appearance. That process may have been derived from the Thompson Patent. 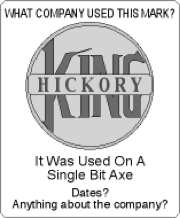 As a general point of information many individuals refer to the relieved markings on axes and hatchets as “embossings.” Actually that is a misnomer or inappropriate term used to describe a marking in the surface of metal that is lower than the material surrounding the design. Embossing is a process that involves a male die being pressed into a piece of material resulting in the design being lower in reference to the from surface. Actually the term embossing is more appropriately used in regard to decorating paper where a male and female die are pressed together with the paper between the two dies. The two controlling factors are pressure and heat. Embossing usually results with the face surface being raised above the design area. Impressing is when a die is forced into the face of a material resulting in a design being lower than the surrounding surface. Many of the lettered word-markings used on axes and hatchets were achieved by means of roll dies which are actually rolled across the surface rather than being perpendicularly stamped into the surface. Impressing from the back of metal material is called repoussé and is accomplished with thin malleable metal. Most decorative markings on axes and hatchets were commonly accomplished by means of etching. Simply speaking, the process involved a mask or frisket that was made by depositing wax on a paper backing sheet, much like that accomplished by a printing process but the wax was considerably thicker. The wax was placed on the cleaned surface of the metal. As the wax adhered to the metal more readily then the paper the paper could then be peeled off leaving the wax where the acid was not supposed to effect the metal. Acid was deposited on the masked area and held in place by a thicker ridge of wax around the outside. Most of the effect of etching was down so minimal material removal was done toward the sides. After sitting for a period of time the acid was expelled. The surface was then rinsed and cleaned resulting in a design that had been dissolved away from the surface of the metal. Various additional steps were involved to create multiple levels but simply put this was the process involved in in decorating ETCHED axes. We DO NOT provide information on fishing rods or items other than those that are classified as tools. There are publications included on the HOME PAGE in the form of Publication Notices. If there are any questions after reading the relevant material on the HOME PAGE additional information may be obtained by using the email contact link at the bottom of the page. A number of additions have been added to the GLOSSARY. New articles are being generated on an ongoing basis. Some are added to this website but due to the amount of information and the space it requires many new articles are published elsewhere, especially in tool collector journals.